App-ranking and market intelligence firm App Annie has released its first-ever apps index for China, albeit only for iOS right now. A ranking for Android apps will likely take more time to cobble together, as Google Play doesn’t have a presence in China and App Annie would have to tie up with third-party Android app stores instead. 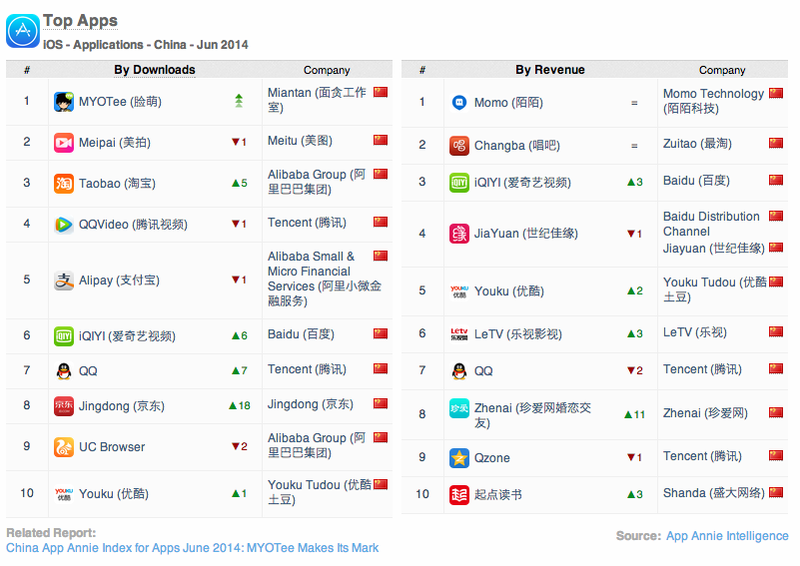 The index found that surprisingly, an avator-creator called ‘MYOTee’ took the top spot by downloads among all iOS apps in China — and even worldwide — in June, although it was “well outside the top 100” in May. App Annie noted that it saw a whopping one million-plus downloads during a three-day holiday for China’s Dragon Boat Festival. The sudden spike in MYOTee’s popularity showcases the power of social networks and messaging apps in China, as it lets users create their own avatars, and share them to their online social circles. In the meantime, e-commerce rivals Alibaba and JD.com are battling it out as their apps are both ranked in the top 10 by downloads for June, while mobile video apps are raking in the money as iQiyi, Youku and LeTV all rank among the top 10 by revenue. As for games, App Annie found — perhaps unsurprisingly — that mobile internet giant Tencent was the top publisher by downloads and by revenue. 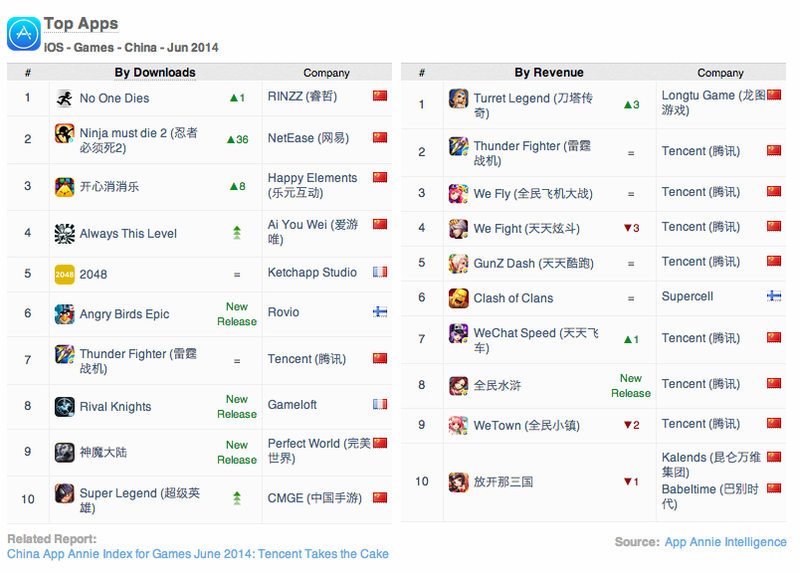 In fact, seven out of the top 10 iOS games by revenue in June were all produced by Tencent. However, there is greater variety in terms of gaming app downloads. Seven out of the top 10 games didn’t feature in the previous month’s ranking, while three out of the top 10 were new releases, and three were published by foreign game companies, one of them being Rovio’s Angry Birds Epic. This shows that Chinese gamers pretty much jump onto any cool new games that surface in the country’s app stores, but to capture their attention and make money out of the games is something that Tencent has honed rather successfully. App Annie’s first-ever apps index in China sheds some light into the behavior of users in the world’s largest smartphone market, but we are eagerly awaiting the Android rankings to surface for a better comparison, given that Android is the dominant OS in the country.